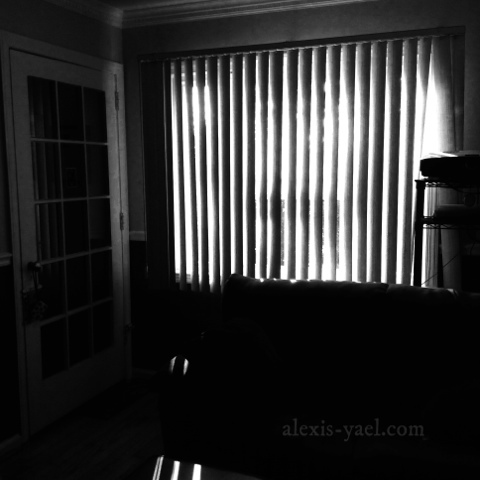 The morning light through the blinds is inspiring, even if it isn't my favorite time of day. It's not sensible to be a night owl, in this North American culture I've lived in my entire life. Nothing is open late, at least not in suburbia, where I currently live. Even when we lived in downtown Toronto, the most urban experience of my life, life was still more morning-oriented than I'd prefer. I have lived my life bucking the sensibilities of the culture around me. Vivid teal/purple/blue/orange hair. Dreadlocks. A shaved head with a wee little low hawk. No makeup. No underwire. No perfume. No hair product. No hair removal. Excessive reading. Excessive online socializing. Excessive over-sharing. Excessive geeking out. Excessive passion. Excessive optimism. Excessive cynicism. Excessive traveling. Excessive liberalness. Excessive creativity. Excessive nerdiness. I don't know that sensibility is the enemy of creativity, but it isn't the way I want to live my life, being sensible and average and normal. I'm happy being eclectic and different. I'm happy being me.